Este caballo de la brujería de Chiloé es grande, de largo hocico con patas en forma de aletas y una firme cola propulsora, semejante a la cola de un pez. Su aspecto no es muy agradable. Es muy fuerte y posee crines de color dorado. Los Caballos Marinos habitan en gran cantidad en los mares frente a la Costa Occidental de la Isla Grande de Chiloé. Se alimentan de algas marinas, especialmente de luche y cochayuyo, por lo cual se explica su color verdoso amarillento oscuro. Como es sabido los Brujos tienen la capacidad de volar, ya sea usando el Macuñ, o transformándose en algún tipo de ave. Sin embargo las leyes de la Brujería les impiden utilizar estos métodos para llegar al Caleuche, en el cual forman una importante parte de la tripulación. La única manera autorizada de abordar el Caleuche es usar a los Caballos Marinos como medio de transporte. Durante los recorridos del Caleuche los Brujos aprovechan la oportunidad para elegir Caballos Marinos de su agrado, marcándolos con su marca personal para que el animal quede en forma permanente a su servicio. Cuando el brujo necesita viajar en el Caballo Marino se acerca a la orilla del mar y lanza cuatro silbidos especiales, con el último silbido aparece el Caballo marino, siempre fiel y atento al llamado de su amo. Dócilmente se acerca a su dueño, entonces éste lo enlaza con una cuerda hecha de sargazo y le palmotea las ancas, luego se sube al suave lomo del animal. El Caballo Marino se deslizara entonces velozmente tras el Caleuche, dejando una estela en la superficie de las aguas y adelantándose a cualquier otra criatura marina. Cada brujo puede tener más de un Caballo Marino. Los hay pequeños para uso personal y otros tan grandes que llegan a medir más de doce varas de largo y de alto superan las cuatro varas (unidad de medida chilota). Estos gigantes son tan grandes que pueden transportar sobre su lomo hasta trece brujos. Los caballos marinos tienen una corta vida de sólo 4 años y cuando mueren se convierte en gelatina que luego se disuelve en el mar, llegando a veces hasta la orilla de la playa. This is a big, long snouted fish with fin shaped feet , and it also has a propelling tail similar to a fish tail. It is considered the fish of Witchcraft. Its aspect is very unpleasant. It is very strong and has golden mane. The Sea Horses inhabit great part of the seas in front of the west coast of Chiloé. seaweed is their main food, specially Luche and Cochayuyo (typical edible seaweed from the zone), that is the reason why this horse is dark yellowish green. It is well-known that The Warlocks and Witches have the ability to fly, either using The Macuñ or transforming themselves into some sort of bird. However,, the laws of Witchcraft prevent them from using these methods to reach The Caleuche, where they are important members of the crew. The only authorized way to embark The Caleuche is by riding these Sea Horses. When travelling on The Calueche, The Warlocks and Witches take the opportunity to choose The Sea Horses they like the most, marking them with their personal stamp, in this way this horse is always at his or her service. 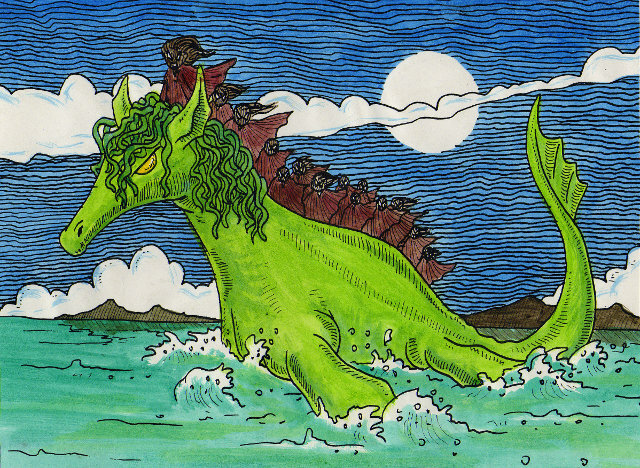 When The Warlock or Witch needs to travel on The Sea Horse, he or she approaches the sea shore and whistles four times, with the last whistle The Sea Horse appears , always loyal and attentive to his/her master’s call. This horse is as malleable as a reed with his master, then The Warlock lassos in the horse with a rope made of Sargazo and pats his rumps and afterwards he / she gets on the animal. The Sea Horse flows gently, and quickly in the sea towards The Calueche, leaving behind him a trail in the water surface and overtaking any other marine creature. Each Warlock or Witch can have more than one Sea Horse. There are some of personal use, but there are others which are very big , that is to say more than twelve poles length and four poles height (unit of measurement from Chiloe). These Sea Horses are so huge that they can carry until thirteen witches or warlocks on their back. The Sea Horses have a very short life , their life lasts around four years, and when they die they become gelatin which is dissolved in the sea, reaching sometimes the sea shore.